I have many stories about my dad and birds. The last few years of my dad’s life were a bit slower than the rest. Because of this, he had more time to look out the window at the feeder that he always kept filled and watch the birds. He lived in Tennessee so the eastern birds were the visitors at his feeder. Chickadees, cardinals, and an occasional nuthatch were the most frequent guests. When my dad passed I came home to Tennessee to get things in order and noticed that the feeder was empty. I had to come home many times over the year after he passed and each time I tried to fill the feeder until there was no seed left. Then I looked in the cabinet for whatever seeds and nuts that I could find. Both of my parents loved nature. My mom, who always kept an impeccable home and decorated it beautifully seemed to fill it with birds. It was a subtle addition that I never noticed until as an adult I developed my own love for birds and started painting them on Uccellino products and Recycled Paper Greetings. One day I was visiting and decided to count how many birds were in their home. Every room had at least one bird in it! I never noticed before. 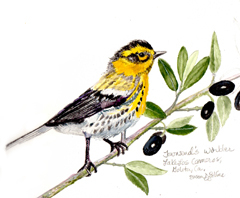 When I came back to Santa Barbara from my dad’s funeral a Townsend warbler was in my olive tree there to greet me. I now think of my dad when I see the Townsend warblers, also when I see other birds, especially painted buntings, but that’s another story.